It bursts onto the screen with the thumping, jangling title song and the great visual homage to the insatiable female pursuit of Keaton’s Seven Chances. It ends with another Keaton homage, this time as a big British kiss to Cops. Everything in between zips along like a Marx Brothers movie wherein everyone is Groucho. It’s one perpetual chase. The image jiggles and wiggles via handheld cameras and setups inside cars and trains. And if the shot slows for even a moment, the editing keeps pushing momentum forward. 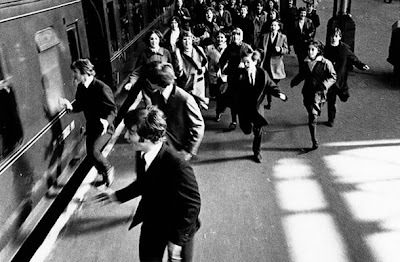 If the viewer mutes the A Hard Day’s Night and just watches it play out in silence, he or she may start to feel a bit of Tony-Scott-style vertigo, as everyone involved in this production seems to be on an espresso-and-amphetamine enema. But in a good way. This is all joy. The worst that will happen is that one may get a headache from the onslaught of happiness. 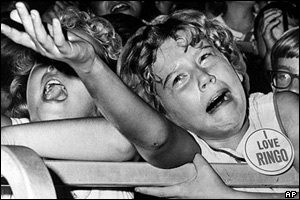 There was precedence for pop music stars in narrative film before 1964. Al Jolson helped break the cinematic sound barrier. He was followed by Eddie Cantor and Bing Crosby. Then Sinatra came along and bared his acting chops in dramatic roles. Elvis then sent the progress back thirty-one steps as he played roles that were not “Elvis” in name, but were clearly an non-actor stumbling through scripted lines. 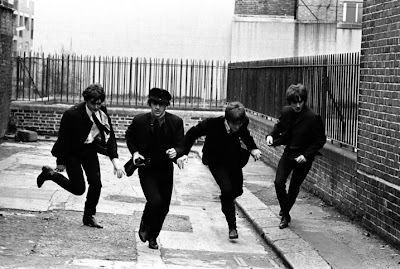 But here in Richard Lester's A Hard Day’s Night, The Beatles are playing The Beatles – sexual angst, live-ish musical interludes, wacked-out fans, and all – as an alternate universe version of themselves: The Four Groucho Marxes. Four Grouchos means four times the non-sequiters, four times the god-awful puns. The issue with this is the terrible hit-to-miss ratio. If there’s a "joke" every 10 seconds (I really attempted to measure this), then that means there’s about 880 jokes in the film. That’s impressive, in its own way. But once one subtracts the stuff that charming due to its unceasing spill, there’s only about a dozen jokes that are actually funny. That’s about a 1.4% success rate. Yes, some of the quips are dated (I wish I spoke ‘60s British), but otherwise the film becomes a very unique experience in absorbing an ocean of words. Thus the humor is bold in its own way. Plus if you listen carefully, there are quips about orgies, drugs, producers, PR, trend setters, and television. My own favorite bits were the visual ones: a silent vaudevillian losing his dove act, shaving on the bathroom mirror, Lennon playing with toys then disappearing into his bubble bath, the end credit sequence, and the aforementioned chases. Unlike Elvis, the Fab Four fare very well with their line reading. That’s no mean feat with the bounty of dialogue. Ringo comes out the best since he’s given the most to do with his character. Oddly, it’s the professional actors that come off incredibly hammy and awkward. 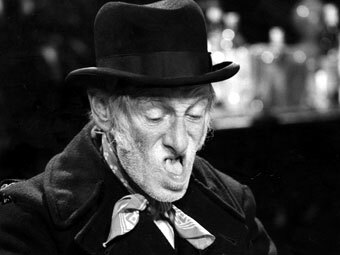 Wilfrid Brambell, who plays Grandfather, is unwatchable which is unfortunate since he’s in every other scene. I’m not sure if I should applaud a punk-style actor’s direction, but it takes great efforts by the Four to keep all of his scenes from sinking the momentum. That’s a mild complaint, though. The visual energy, constant invention, and The Beatles win out in every scene. Pardon this abrupt change in tone, but I want to close with an observation about the ending, which itself is a shift in palettes. 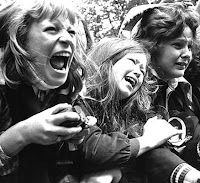 As The Beatles perform in a small auditorium, hundreds of girls shriek out of control, weeping, screaming incoherently, bodies contorting and spasming. At first it’s irritating, then funny, then frightening. It’s filmed so intensely that it’s not a visual accident. I understand that the specific context is dated, but it’s very unsettling. There’s probably a sociological explanation for it, but what is it? Hundreds of years of sexual repression? (Also see: Justin Bieber, Twilight.) 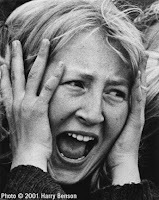 It reminds me of Alan Parker’s and Roger Waters’ vision of a rock band as a fascistic power, working up the mostly male youth to the brink of insanity then setting them loose to destroy in The Wall. Here at the end of A Hard Day’s Night, the young hunting horde has cornered their pop star prey. But rather than ravishing them like the Maenads of myth, the girls stand in place screaming in a frenzied mass, perhaps hypnotized and unaware of their own sexual power, or just seduced by four boys in bad haircuts.